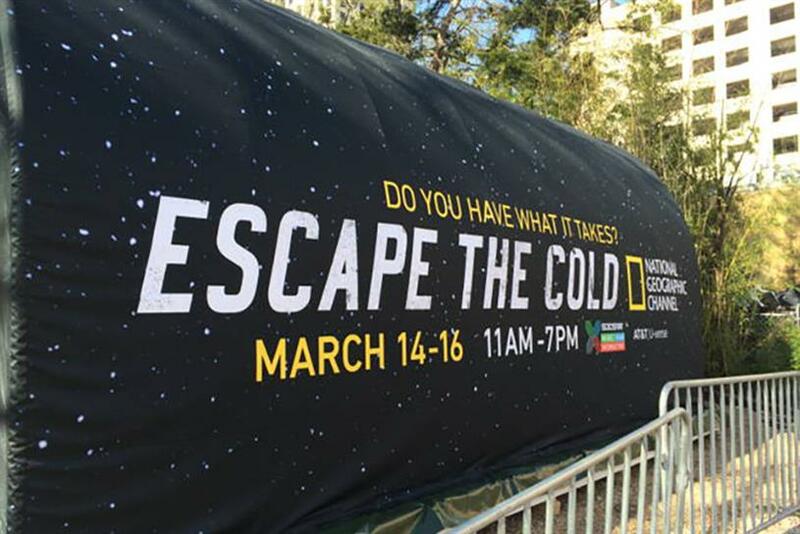 National Geographic challenged SXSW attendees with its activation. AUSTIN — Last year's SXSW interactive was cursed by cold rain of Biblical intensity. Day after day, the nerds were pummeled by diagonal sheets of rain or stark gray cold, until glorious sunshine arrived with the rock-‘n’-roll crowd swooping into town for the music portion of the festival. Not this time. Interactive is bathed in sunshine, hot enough for T-shirts and al fresco dining. The brand-spanking-new sparkly JW Marriott glistens in the sunshine — its ground-floor, open-air Corner bar has already become a distraction for any SXSW Interactive attendee who can't get into one of the many sessions hosted in the hotel's conference rooms (That’s turned out to be many. Lots of the most interesting and popular panels seem to have been put in woefully small rooms). It's a fitting role reversal. Rumor on campus is that hotel-room sales for SXSW Music are down for the first time. Meanwhile, Interactive is bigger than ever. It's dripping in star speakers. Everyone from Russell Brand to Jessica Alba is on the lineup. And of course there are the MIT experts, the Biz Stones, Al Gores, and the great and the good of tech world. These, in many ways, are the new rock stars of our culture — so let them have the sunshine I say. Already the back lawn in front of the Four Seasons has taken on the vibe of a heady summer festival with hipster-styled media, tech and media revelers sipping beers as the sun sets over the Colorado river. The highlights so far? Paola Antonelli, senior curator at the Museum of Modern Art, gave a brilliant talk on how designers are pushing new boundaries and creating credible future solutions to world problems by exploring the intersection of disciplines from science, biology, technology and design. She talked in particular about how creatives are revisiting old techniques and craft to create sustainable furniture materials. Like Formafantasma, a studio that has experimented with resins made from insect excrement. She also talked about the growing intersection between biology, science and design — designers using biology to "grow" art forms, as MIT Media Lab's Neri Oxman has done with her Silk Pavilion, a giant structure woven entirely by silk worms that followed a basic wire frame and created a web around it. Other designers are growing alternatives to Styrofoam using mushrooms. These creatives spilling outside traditional parameters will help shape the future. Overall, the blurring lines between biology and technology were big themes on the first day in general. Connor Dickie, CEO of Synbiotica, and MIT Media Lab Director Joi Ito, Orkan Telhan, professor at the University of Pennsylvania, and Rib Carlson, Managing Director of the Bio Economy Capital ran a panel: "Synthetic Biology: Do, Learn, and Dream." Koert van Mensvoort also gave a talk: "Next Nature: How Technology Becomes Nature." Sustainability is also becoming a rising theme. Al Gore spoke about the "Challenge" and "Opportunity" in the climate crisis. The creative director and president of sustainable luxury brand Maiyet, Kristy Caylor, was also the center of a talk on the future of sustainable fashion. Maiyet, like Toms — the one-for-one shoe brand — has created a new business model to be sustainable. It has established craft hubs in emerging economies and works with local communities to make its goods. Finally: There are a bunch of brand "activations" here, many of which are predictably unimaginative and self-serving. National Geographic Channel's "Life Below Zero, Escape the Cold" experience stood out as a good one. The pop-up is a series of pods that simulate the icy conditions of Alaska inside. Visitors taking part are asked to sit in the pods and complete challenges and tasks as the temperature drops to freezing. We've seen this a lot recently. Experience-hungry Millennials have progressed beyond wanting immersive cinema (Future Cinema) or visiting cocktail bars that are actually imagined stage sets of Phileas Fogg, complete with actors exchanging lines as they pour you a themed drinks (See Mr Fogg’s, Mayfair). Increasingly there's a desire for experiences to be challenging, uncomfortable or even scary for bragging rights. "Life Below Zero" is a good example of this. Plus, if you win, you drink free for the rest of the conference.